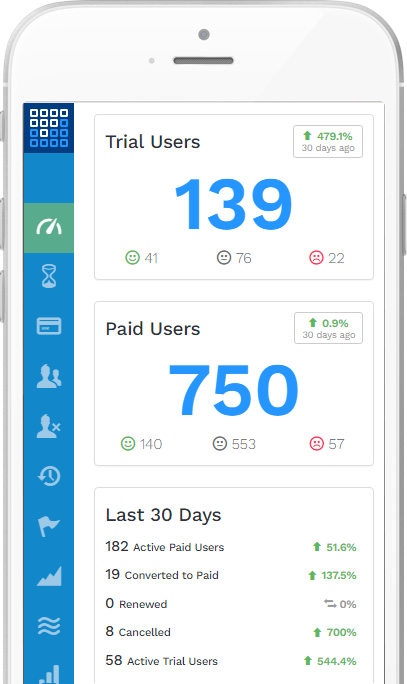 Unwaffle will analyze the behavior of your users to help you keep them on the happy path. It's Onboarding and Lifecycle Metrics for your SaaS business. Happy users are more likely to convert to paying customers. Watch your users as they progress through their Trial period. Unwaffle will compile a profile with a Happiness Index that can tell you with a surprising degree of certainty whether they will convert to a paid subscription once their Trial is up. We'll collect as much data on user behavior as you can throw at us. Over time, our predictions will become more reliable as we get a better feel for what motivates your users. Learn more. Tune your lifecycle mail strategy to include a special path for troubled users. 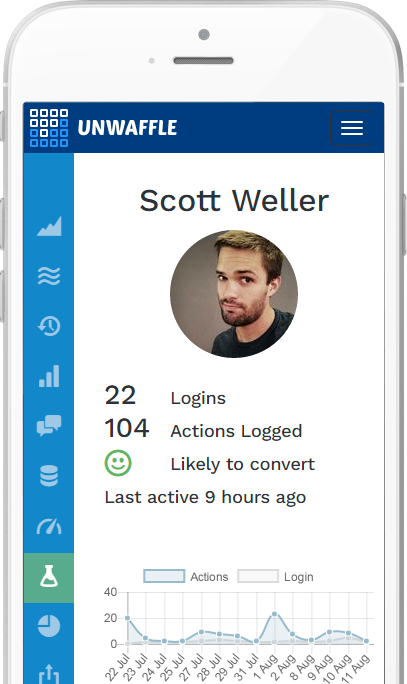 We make it easy to identify specific goals for users based on their observed behavior. Learn more. What can you reason about your users from their behavior? What are they doing? Are your successful users doing anything different? What are they not doing? Are your failing users getting lost somewhere? Are there patterns we can find? Can we predict who will be successful? Who is headed for success? Are new users slotting in to the groove we've identified as the path to success? Who is headed for failure? Can we identify users who are straying before we lose them? How can we do better? What can we do to steer failing users back towards success? Happy customers are more likely to remain Paying customers. We'll stay vigilant even after a customer has activated, watching for danger signals. Pre-empting churn is much easier than trying to win back customers after they leave. We'll give you the tools you need to re-engage your customers before their attention can wander too far. The same Machine Learning algorithm we user for Trials will analyze your paid customer behavior, forming patterns that signify a user in danger. Learn more. Automatically re-engage your troubled customers by setting up API Webhooks to your own system or a third party. Learn more. Unwaffle is tuned to focus on the onboarding and lifecycle concerns of your Software as a Service (SaaS) business, so you get just the inforation you need, without any distracting general-purpose features. Learn more. API Client Libraries are available for all major languages and platforms. Report any action with a single line of code. Use our pre-defined action labels or add your own on the fly. We'll add anything you send us to your user model. Flexible pricing, sized to fit your business.